CareerOneStop is at the American Association of Community Colleges (AACC) Workforce Development Institute in New Orleans this week. This year’s conference is focused on “Exploring Intersections” and examining the ways that community college workforce and economic development efforts require collaboration across policies, practices, initiatives, partners, and funders. We’re meeting lots of great education and workforce professionals and we’re hearing a lot about career pathways—specifically about community colleges partnering with industries to understand and create career pathways that can enable individuals to move from entry-level positions to career success. 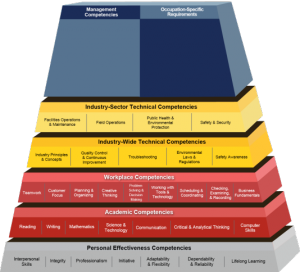 That got us thinking about what a great resource the Competency Model Clearinghouse is for workforce development professionals. The CMC is a website sponsored by the U.S. Department of Labor, Employment and Training Administration (ETA) with the goal of informing the public workforce system about the value, development, and uses of competency models. It features great examples, explanations, and instructions for building competency models and career ladders and lattices. Visit the CMC’s Career Ladders/Lattices General Instructions to learn how to build career ladders/lattices that outline critical experiences individuals need to progress through a career in an industry. Develop or update a certification, license, or assessment using competency models. Use competency models to assess or develop a curriculum. Measure worker performance, assess training needs, and select or recruit workers using competency models and career ladders/lattices. View the competencies needed in selected industries to help determine which career is right for you.